Sometimes you have to keep a column topic in your pocket until the time is right. That’s the case with a trip I took back in May. I was among a group of writers for Guideposts magazine who attended a weekend workshop in Philadelphia. As tempted as I was to write about the visit as soon as I got home, it made sense to save those columns until now, the month when we celebrate the birthday of the USA. I felt the vibes from the City of Brotherly Love not long after I got off the plane. With no idea how to get downtown, I approached a woman at the airport information desk. Not only did she explain that the SEPTA train was my least expensive option, she walked me outside to the kiosk, showed me how to buy a ticket and pointed me to the platform where I needed to wait. 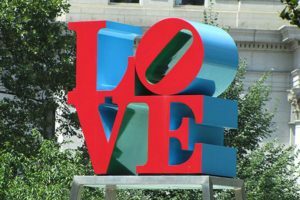 Philly’s iconic Love Statue, one of the first things I saw when I got off the train, was icing on the cake. While I waited for my friends to arrive that Friday afternoon, I decided to explore downtown on foot. My adventures included the Free Library, Boathouse Row, and the grounds of the Philadelphia Museum of Art. Like most of the other tourists, I ran up the steps humming the theme to “Rocky” and waved my fists in the air when I got to the top. And I felt only the slightest bit sheepish. Two culinary experiences are worth mentioning. The first was brunch at Sabrina’s Café on Callowhill Street. I ordered Mexi-eggs, biscuits and black bean grits. “Do you know what grits are?” the waiter asked. He lifted one eyebrow. “So that means yes?” I nodded. The eggs were overcooked and the biscuits dry, but the grits were delicious. To my dismay, the last day of the trip arrived without my having eaten a Philly Cheesesteak sandwich. As luck would have it, I finished my tour of the historic district just as Sonny’s Famous Steaks on Market Street was opening for lunch. I was first in line. “I’ll have a Philly Cheesesteak sandwich,” I told the woman taking orders at the far end of the griddle. She rolled her eyes and sighed. “You don’t call them Philly Cheesesteak sandwiches when you’re in Philly,” she said. “They’re just cheesesteak sandwiches.” So much for brotherly love. The good news is that the sandwich was even better than Sabrina’s grits. Then it was time to board SEPTA and head for the airport. Next week, in celebration of Independence Day, I’ll write about my visit to Old City.